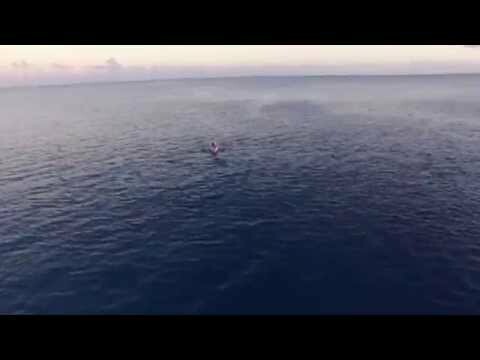 Six British women have become the first all-female team to row across the Pacific Ocean after spending nine months at sea. Known as the Coxless Crew, the women have just completed their 8,446 mile journey from the Golden Gate Bridge in San Francisco to Cairns in Australia, arriving just before 1am on Monday January 25. The team is comprised of three permanent members, Laura Penhaul, Natalia Cohen and Emma Mitchell, and three – Isabel Burnham, Lizanne Van Vuuren and Meg Dyos – who rowed a leg each. The team took 257 days to reach Cairns by rowing 24 hours per day in two-person two-hour shifts – meaning they could sleep for only around 90 minutes at a time. They stopped just twice, for a week in both Hawaii and Samoa, to restock supplies and swap crew members. Along with the hardships of sleep deprivation and lack of fresh food, the women also encountered heavy storms and humpback whales that threatened to end their time aboard the pink 29-foot rowing boat nicknamed Doris. However, the row was not all hardship as the team were treated to the sight of pods of dolphins, schools of mahi-mahi dolphinfish, sea snakes, flying fish, albatrosses and two sharks christened Eduardo and Fernando after the pair followed their boat for a number of days. 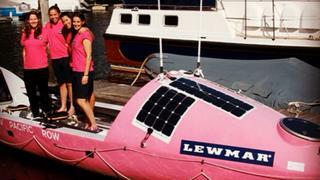 Despite finishing three months later than originally planned, the Coxless Crew still managed to set two world records for first team of women and first team of four to row across the Pacific Ocean. The women undertook the challenge in order to raise money for Walking With The Wounded and Breast Cancer Care and kept a blog throughout their journey to keep followers up to date. Writing in her final post on Sunday evening, founder and team leader Laura Penhaul wrote, “It has been an exhausting and emotional few days as we make our approach to land. The last 8500nm don’t matter anymore, it is all about these last 20. The woman have so far raised more than £36,000 for their chosen charities and, although the challenge is now complete, there is still time to support this worthy cause. To make your donation simply visit virginmoneygiving.com. Of course, this is not the first time humans have undertaken incredible nautical challenges in aid of charity. British woman Sarah Outen recently completed a gruelling round-the world adventure in aid of a number of charitable organisations while Lewis Pugh swam the Antarctic in a pair of Speedos to raise awareness about the effects of human interference in the Ross Sea. A team of British sailors have also recently launched the Row2Rio world record bid - setting out from London on 16 January to cycle and row to Brazil in time for the 2016 Olympics in aid of the Macmillan cancer charity.